The North of France | Hello Cool World! Michel et Elizabeth: dwarfed by their house and their hospitality. North from Paris, from a one room apartment and millions of people to a large stone farmhouse in the tiny village of Villers Chatel near Arras in the northeast of France. It was bliss – from shared space to our own private bedrooms. Our Servas hosts, Elizabeth and Michel, fearing that we spoke no French, had invited their bilingual cousin Andre (30 years ago he lived in Quebec) to dinner that evening. We had a wonderful meal together and pored over maps to plan an 18 km bike route to the memorial at Vimy Ridge. 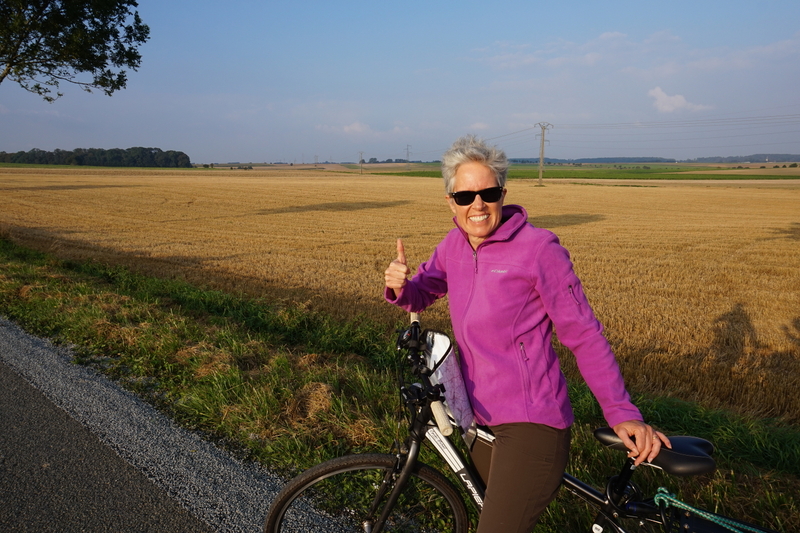 The next day, we set out on bikes across the countryside, past fields of sugar beets and through the many tiny villages. I’ll leave the details on the war memorials to Chris and Aran, but I will say that a day of cycling was magical. It took me back to a lifetime ago when I cycled with a friend from Calgary for 11 weeks through central south France. This is a country that is built for cyclists. 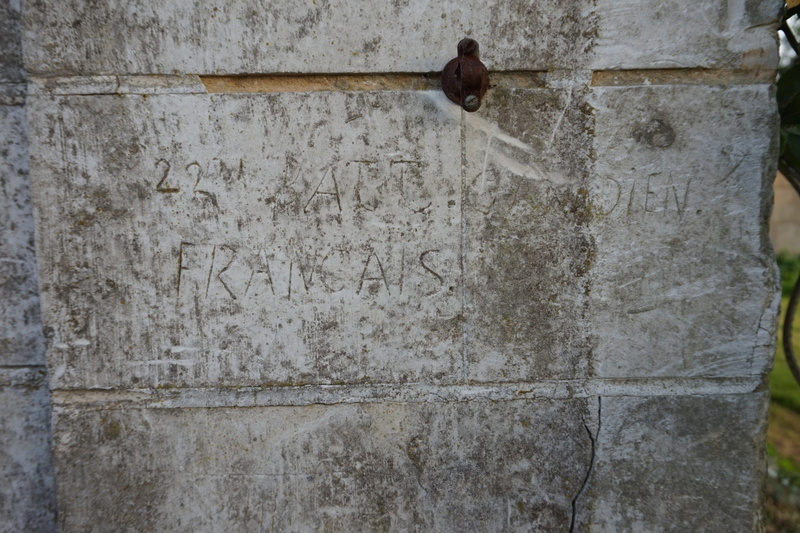 When we returned, Elizabeth and Michel showed us the graffiti carved into the cornerstone of their house. Apparently, it was used to billet soldiers from the Van Doos (Royal 22nd) regiment from Quebec during WWI. 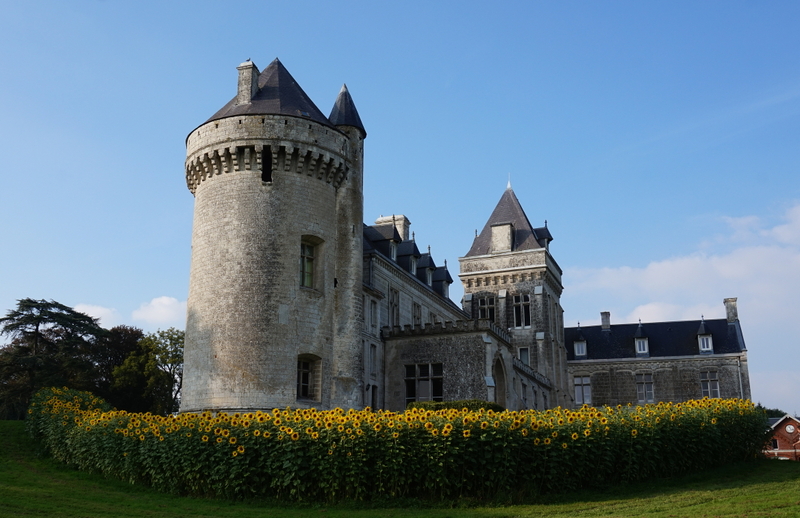 We also strolled about the town and found, just around the corner, a fantastic chateau. It does seem, sometimes, that every small town has to have one. The Van Doos slept here. Waiting for moules et frites. The next day, Andre proposed a day trip to Brugges. This is the magic of Europe – Brussels is less than an hour away. Brugges is a mini Venice, known for its canals, chocolate and mussels with fries (moules et frites). So while it wasn’t difficult to choose what to eat, choosing our drinks was much more difficult given that Belgium produces over 800 different beers. Nevertheless, we managed to overcome that slight hurdle. The following day we went with Andre and his wife, Francine, to the Arras market to pick up stuff for lunch. They cooked up an amazing meal for us, complete with his homemade vin de noix – absolutely delicious!! With Brigitte, Jean-Claude and a map. 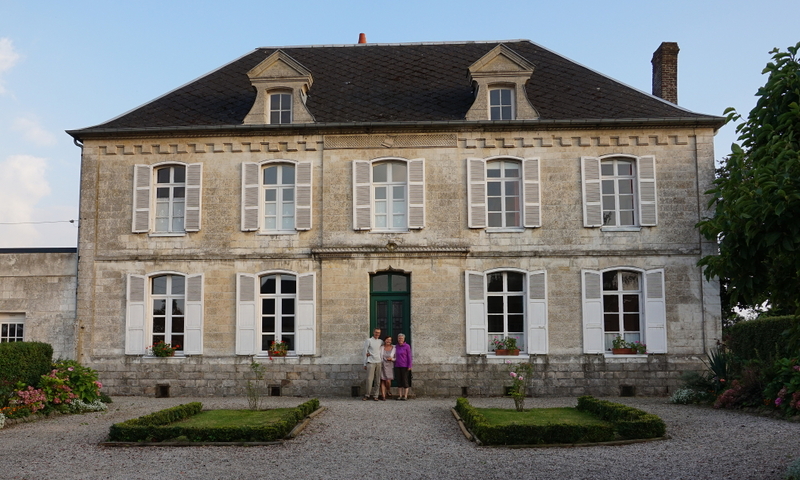 After our four days near Arras – Michel and Elizabeth had so very generously offered us the use of their house for two days while they were away – we decided it was time to move on and so off we went. We drove down the coast and stayed in a lovely gite near Honfleur – the town from which Samuel de Champlain departed to found Quebec City in 1608. 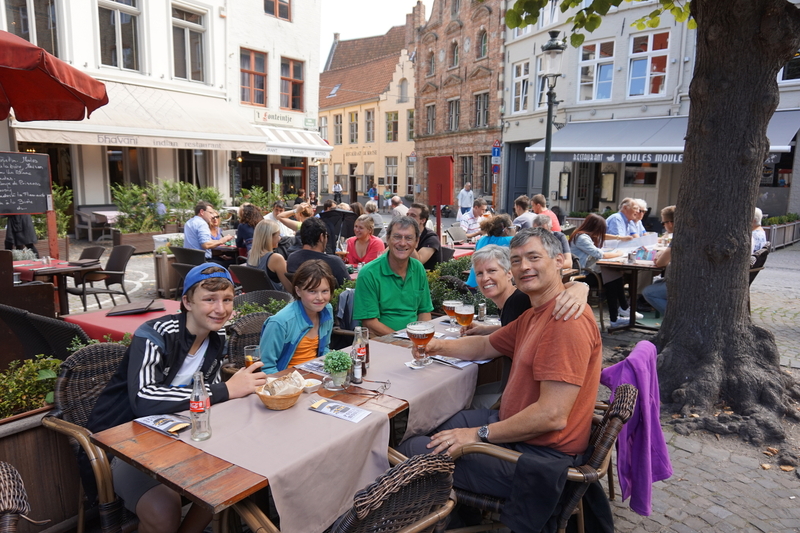 The next day brought us to Caen where we stayed with another wonderful Servas family, Brigitte and Jean-Claude. The highlight for Chris was the evening tour of their rooftop solar panels! This was where we really tilted into WWII history – but see Chris and Aran on that. 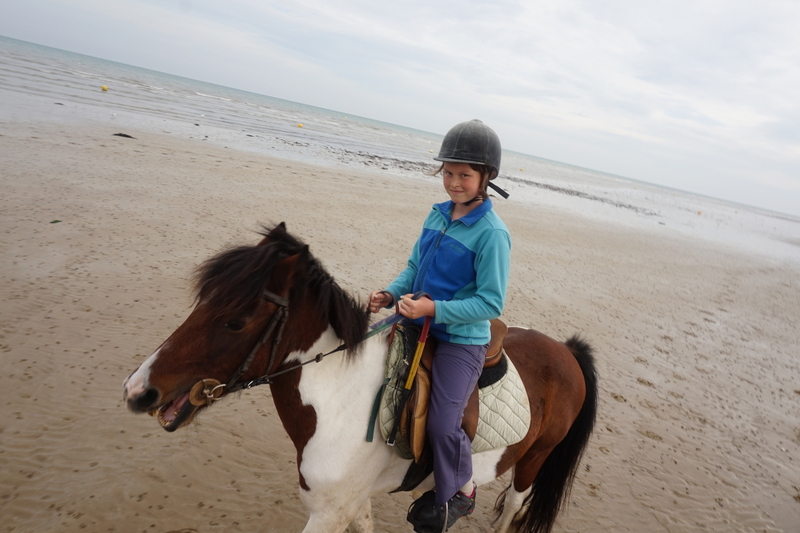 While we hope that Eva will retain some memories of the Normandy beaches with regard to their role in WWII, she will surely remember them as the place we went horseback riding in France. We also hope that the children will remember the fabulous tapestry at Bayeux. Nearly 230 feet long, this incredible tapestry dates back to 1070 and recounts, in 50 different scenes, the events leading up to the Norman conquest of England by William the Conqueror at the Battle of Hastings. The audioguide whipped us along so fast that we had to go back to the beginning several times to absorb what was being described. Nevertheless, I think we all learned a bit about the beginning of the troubled history between the French and the English. 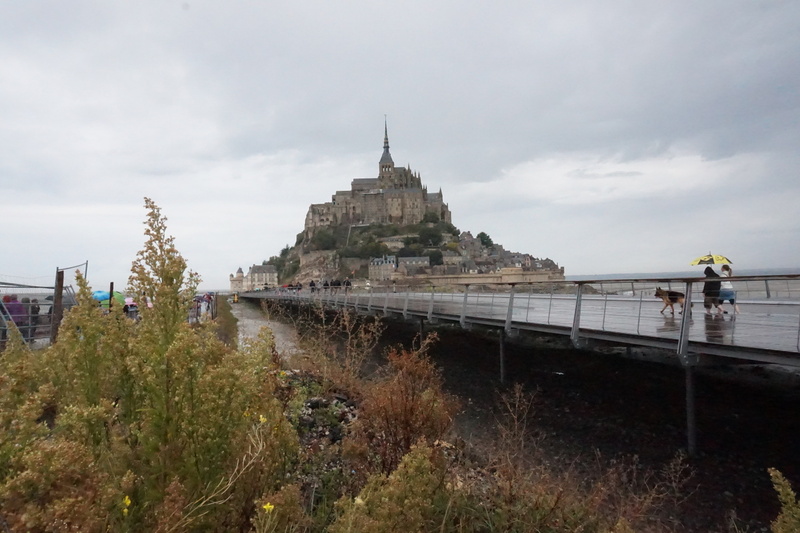 Moving west along the coast, we made our own pilgrimage – not that day to Mont St. Michel as many still do – but to Cancale, a small town known for its oysters. A happier boy than Aran could not have been found that afternoon as we sat on the edge of the dock and slurped back cheap, but amazing, raw oysters on the half shell. Past, present, and future world travelers. A quick drive through St. Malo (and more Canadiana history as this is the place from which Jacques Cartier departed in 1534) we landed at our next Servas hosts, Pierre-Yves and Helene (along with their three lively children, Elliot, Salome and Anais), just outside of Rennes. It is from here that we backtracked north to Mont St. Michel, one of the most incredible places in all of France and a UNESCO World Heritage Site. 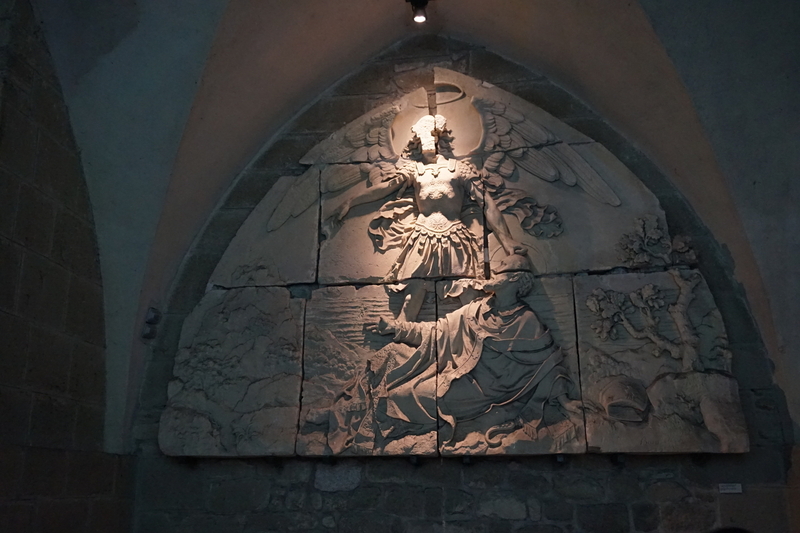 According to legend, it was on this rocky island that the Archangel Michael appeared to St. Aubert, Bishop of Avranches, in several dreams in 708 and told him to build a church. Apparently the bishop didn’t take these visions seriously until Michael burned a hole in the bishop’s skull with his finger; a more persuasive technique I cannot imagine. Over the years many additions have been added to the original abbey, and a town grew up around the base of the island. The result is an incredible warren of lanes and stairs, all leading to the summit which is topped by gold statue of the Archangel himself. Mont St. Michel: location is everything. “Always follow your dreams.” Motivational theory hasn’t changed much over the centuries. 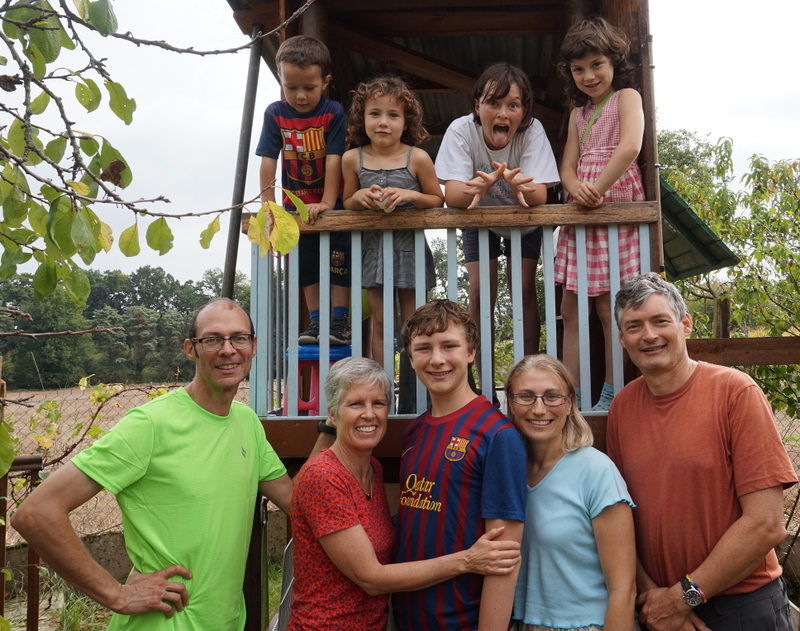 After a great day of exploring, we returned to our hosts and spent the next morning discussing politics and travel and playing soccer in the backyard before heading south into the Loire valley. Our minds and stomachs have never been better fed than they have been over the past two weeks! ← We Land… and Take Off! I am motivated by moules et frites! I don’t think you need to worry about the social studies curriculum. They will have learned more in this month than could have been covered in four at school. Can’t wait for the boys in the family to contribute to the blog! My chin is on the floor!!! Oh how I would love to experience what you are so aptly describing. Happy that your lovely family gets to do so. Way to go in following your dreams. You get an A+!!! Keep the blogs coming, I enjoy every word. I love the house in Villers Chatel! 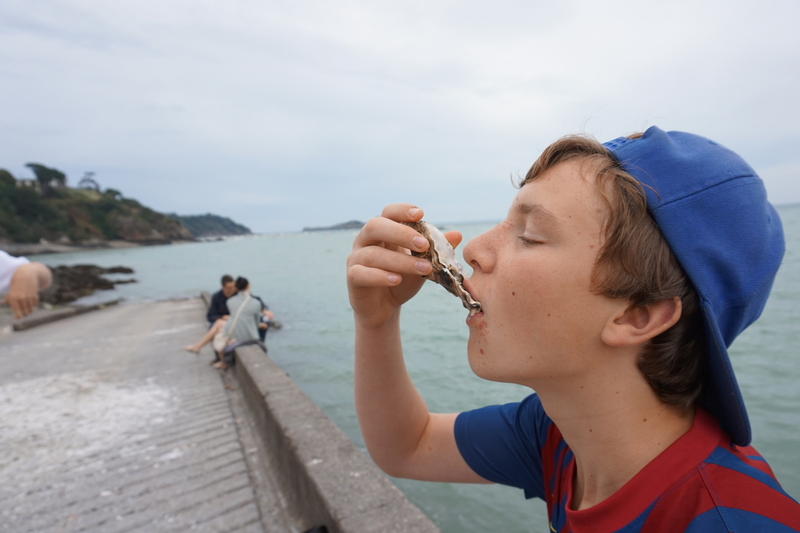 And who knew Aran was an oyster-eating sophisticate! Great post, Nancy, you’re a great writer. Looking forward to the next installment of Ice Cream around the world! Thanks Mommy! I had the most amazing day today. Our host family took us hiking across from Mont Blanc. It felt like I was back in the Rockies. Blog post to follow as soon as we find some down time!